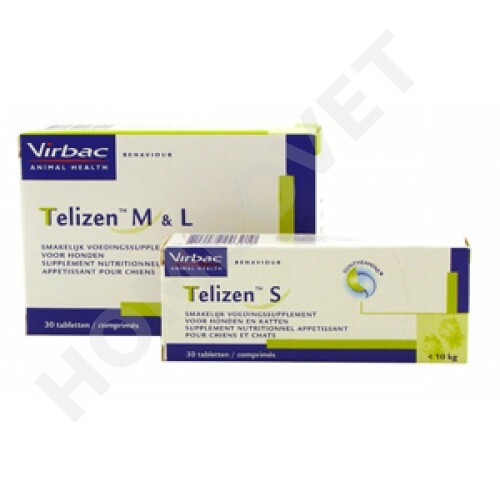 Virbac Telizen are calming tablets for dogs and cats. Telizen reduces anxiety that is associated with behavior and helps the animal to calm down, it promotes relaxation without side effects such as drowsiness or other inconveniences. This supplement for dogs and cats contains L-theanine that dampens the reaction to abnormal anxiety and has a calming effect. The use of this supplement Telizen is recommended in case your dog/cat is fearful outdoor, is afraid of other animals; is nervous due to changes in your house; anxious due to fireworks, vet visit or traveling. Use for at least two months optimal results. The treatment can be repeated indefinitely. L-theanine, derived from the tea plant. Size S: 50 mg, 30 tablets, click here for the leaflet. Use for at least two months optimal results. Telizen is to be administered twice daily. The animal will feel it as a reward, because Telizen has a delicious taste!